Designed to spread all types of flanged pipe connections to insert blinds, gaskets and orifices. Quick and easy removal of defective gaskets and the installation of new gaskets. Maximize safety, no hammers, chisels or wedges needed. 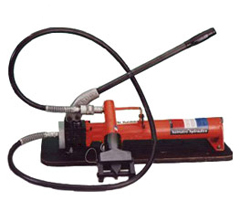 Simple to use and position, Speeds up repair time. Lightweight, easy to carry and assemble, ready to operate in seconds. Handles ASA raised face, ring-type-joint and cast iron flanges. Compact, light and easy to carry. Comes in 7 lb. to 20 lb. weights. Comes with a two speed hand pump or a foot pump. Hydraulic, easily overcomes, high tension on the flanges and opens them to give space for renewal of the packing. Spreader jaws automatically follow the spread of the flanges. Automatic change over from 1st to 2nd stage. Automatic air vent valve on reservoir. For big flanges a number of spreaders can be used. Special wedges are available for exceptionally wide packing gaps. Powerful, easy to mount, lightweight. Packed, complete with accessories in a handy steel carrying case. Weighs only 20 pounds, light, compact . Provides continuous, critical control for extreme accuracy in alignment and positioning for spreading pipe flanges. The hydraulically actuated piston presses the wedge forward between the lift plates, spreading them apart and exerting powerful lift. Comes in Standard model or Floor model where a flat surface is required. Safe, smooth, precise control for critical positioning . 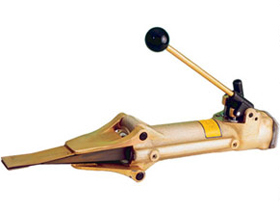 Stays in position without strapping or clamping. Used for flange spreading, blinding flanges, valve service, leveling, lifting, alignment, prying, moving, wedging, etc. 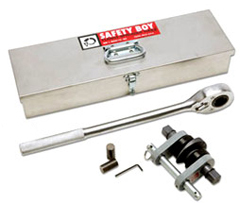 Lightweight, compact, fits in .070" of space (fits in toolbox). 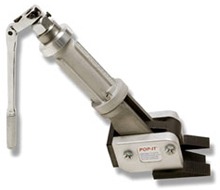 Hand operated, unique for tight spots ratchet. Weight: 10.5 lbs. ; Height: 11.75"; Toe width: 3.5". Rated capacity: 100 ft lbs Input and 10,000 lbs of Lift.